You would have thought that some great novels could be written with Shakespearean themes. The mysteries surrounding his identity, the rumours and suggestions of missing plays, the dark lady of the sonnets, there’s so much potential source material out there. Almost any half-decent author should be able to hit a home run with this kind of stuff. 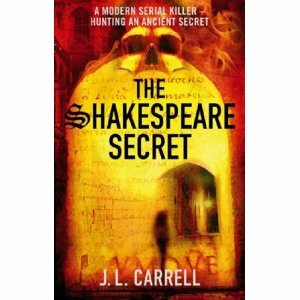 And yet, somehow, JL Carrell swung and missed with The Shakespeare Secret (also known as Interred with their Bones in the USA). It’s a real shame. Carrell is a genuine Shakespeare expert, having taught History and Literature at Harvard and being the owner of English degrees from Harvard, Oxford and Stanford. Her area of research was the influence of Shakespeare in the American West which, unsurprisingly features strongly in The Shakespeare Secret. It’s quite apparent from the book that she knows her Shakespearean onions. Unfortunately, she wants to share all of them with us. Consequently, the story becomes a bit of a mess, trying to knit together elements of the authorship question, a search for the manuscript of Cardenio, a missing Shakespeare play, the identity of the protagonists of the sonnets and Shakespeare in the West. I can’t help feeling that Carrell is trying a little too hard and that she could probably have got a couple more novels out of the material if she had been more judicious with it. Carrell’s heroine is one Kate Stanley, a former academic turned theatre director. A few days before her Globe production of Hamlet is due to open, rehearsals are interrupted by a surprise visit from her erstwhile mentor, Roz Howard. Soon, Professor Howard is dead, the Globe is torched and Kate is on the run from the police, accompanied by an enigmatic former SAS officer and in possession of a mysterious gift from Roz. From there, we are taken on a breathless hunt from London to Cambridge, Massachussetts, where there is another arson attack, this time on Harvard’s Widener Library. The trail then skips backwards and forwards across the Atlantic, climaxing in the Arizona hills. If you have read any of Dan Brown’s Robert Langdon novels, you will be familiar with Carrell’s style. There are lots of clues to be solved, plenty of chases and her main novelistic technique appears to be to use plenty of pace and attack to distract the reader’s attention from the holes in the plot, the totally implausible coincidences that litter the book and the cardboard characterisation. Every character in the story appears to speak in the same kind of voice and, just like Dan Brown’s characters, they can’t seem to be able to resist giving potted lectures to help the story along in a way that no real person would ever do. I have one other minor quibble. Carrell, despite having studied in England, makes some fundamental mistakes in her treatment of scenes set in England or with English characters, including an incorrect English street name and a comment on the likelihood of being a victim of crime in London that would have been anachronistic in 1950s London, let alone the London of the 2000s. I appreciate these are minor criticisms but they did have a negative impact on my enjoyment of the book. It wouldn’t have taken much research to get this right. It’s not all bad, though. The story moves quickly and there are some interesting Shakespearean titbits. It’s a harmless, sub-Dan Brown page turner which whiled away a few hours and would be moderately amusing for any Shakespeare fan with a taste for detective stories. Literature this ain’t, let alone the Great Shakespeare Novel but I’ve bought the sequel anyway. Did you consider using the best Bitcoin exchange service - Coinbase. Claim faucet satoshis at Moon Bitcoin. 514 satoshi every 24 hours. Over at Bonus Bitcoin you can get free satoshis. Up to 5,000 satoshis every 15 minutes. If you are trying to buy bitcoins online, Paxful is the best source for bitcoins as it allows buying bitcoins by 100's of payment methods, such as MoneyGram, Western Union, PayPal, Visa, MasterCard, American Express and even exchanging your gift cards for bitcoins. Ever considered maximizing your free BTC claims by utilizing a BTC FAUCET ROTATOR?